Adobe Experience Manager is a content management system offered by one of world’s leading content management suites. The software covers dynamic digital asset management, and also offers form and document management solution, community connection portal, user-generated content organization, and social engagement platform. This Experience Manager acts as a central workstation for creative teams that seamlessly connects with their present work processes and streamlines media delivery to other teams. With this Adobe product, dispersed teams are able to manage their digital assets without difficulty. The solution further provides them an arena for delivering attractive media enhanced for different channels on demand. In addition, Adobe Experience Manager connects with other products such as the Creative Cloud and the Marketing Cloud. This enables teams to create, curate, and distribute media across various avenues to bring about an enriched customer journey for their clientele. Experience Manager’s built-in DAM allows users to safely store and manage their visual assets in the cloud, giving team members inimitable access to project files wherever they are in the world. With this central storage system, work becomes more efficient as files are easily at hand from the cloud. This feature bridges the DAM and marketing sides of the company. It simplifies workflows, enabling team members to deliver high-quality content consistent with the company’s branding and identity. Experience Manager allows users to add tags and metadata to files uploaded in the cloud to facilitate easy access to media. With tags and metadata, users spend less time looking for files and spend more time working on projects instead. The search function is customizable and allows teams to configure how the software will sift through the database to find the correct media. The indexing feature makes future searches faster to further improve team efficiency. Experience Manager paves the way for globalization. Assets can be organized and tagged for translation allowing organizations to reach a wider audience. The software provides individual workspaces for uploaded projects so the dashboard is not clattered and teams do not collide within the interface. Further, each member is assigned a role in the organizational structure so they know what they are supposed to do for different work groups. And when they are working on a project, they can use the commenting and annotating functions for feedback. They also receive instant alerts when their owned asset receives a reaction, such as update requests or project green lights for a more controlled workflow. Experience Manager does more than curate uploaded assets. The software automatically converts files into different formats so companies can engage audiences across numerous channels and platforms. The application also makes available for purchase products featured in media showcased on a brand’s portal. Brands can use Experience Manager to showcase products using interactive video adapted to multiple screens. It assists them in driving engagement and leveraging customer experiences to inspire brand loyalty. In addition, the service offers insights and analytics to understand site visitor behaviors and streaming tendencies. Experience Manager provides brands a platform to create media that truly reflects their identity. This enables them to offer customers tailored content along with consistent brand experience. Experience Manager measures user interaction with content. This gives brands an idea what makes their audience click so they can tailor campaigns using that insight. The software shortens the time between approval and market dissemination with a custom brand portal. Through it, brands can make available ready-to-go assets to internal and external team members on-demand. 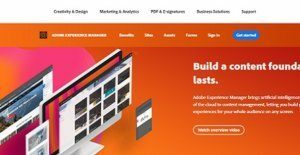 If you are interested in Adobe Experience Manager it could also be beneficial to examine other subcategories of Best Digital Asset Management Software collected in our database of SaaS software reviews. Since each organization has particular business wants, it is prudent for them to desist from looking for a one-size-fits-all ideal software system. Needless to say, it would be pointless to try to find such an app even among popular software platforms. The smart thing to do would be to catalog the various essential aspects that require consideration such as key features, budget, skill levels of workers, company size etc. Then, you should do your groundwork thoroughly. Read some Adobe Experience Manager reviews and check out each of the other apps in your shortlist in detail. Such exhaustive homework can make certain you reject ill-fitting applications and choose the app that presents all the aspects you require for business success. How Much Does Adobe Experience Manager Cost? Adobe Experience Manager’s SMB and enterprise pricing information is available only upon request. Contact the company for more details, and ask for your quote. We realize that when you make a decision to buy Digital Asset Management Software it’s important not only to see how experts evaluate it in their reviews, but also to find out if the real people and companies that buy it are actually satisfied with the product. That’s why we’ve created our behavior-based Customer Satisfaction Algorithm™ that gathers customer reviews, comments and Adobe Experience Manager reviews across a wide range of social media sites. The data is then presented in an easy to digest form showing how many people had positive and negative experience with Adobe Experience Manager. With that information at hand you should be equipped to make an informed buying decision that you won’t regret. What are Adobe Experience Manager pricing details? What integrations are available for Adobe Experience Manager? Adobe Experience Manager fluidly integrates with other Adobe Experience Manager solutions. However, the software has limited integration with third-party applications. For more information, see the software reference materials or contact Adobe support. If you need more information about Adobe Experience Manager or you simply have a question let us know what you need and we’ll forward your request directly to the vendor.